« Why Should I Hire a Commercial Tree Service? Commercial lawn care is very important. It shows your clients and customers that you’re serious about where you work and want to keep it looking nice. It can be a real hassle having to deal with lawn care yourself, though. Mowing, weeding, and planting can take up a lot of time that you could use focusing on customer service and building your company. Contracting out your landscape maintenance needs gives you the freedom to work with someone who knows how to take great care of your business as well as how important it is for you to do what you do best while they do what they do best. We’ve compiled our top 4 reasons why professional landscaping can benefit your Glen Burnie business. Consistency – In order to get consistent results and that pretty lawn mower pattern in your grass, you need to talk to a professional. Companies will usually assign a specific team to your landscaping needs. 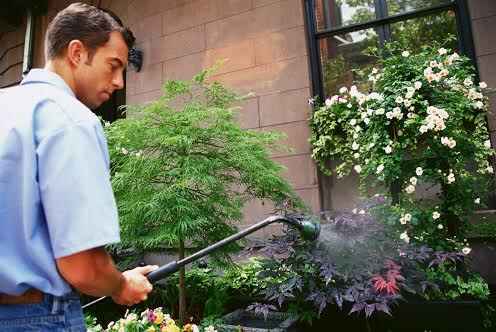 They’ll know what you want and need and can deliver consistent service when tending to your lawn, flowers, and trees. It’s a stress-free way to have your landscaping taken care of. Professional Equipment – Instead of buying expensive, professional equipment, it’ll save you money to simply have someone come in and use the professional equipment that they already have. If you have a lot of landscaping around your business, it can require a lot of work with equipment that you likely don’t have. Landscape maintenance companies can do the work quickly and efficiently with efficient products that they use every day. Time Saver – You’re running a business, here. Time is of the essence. Anyone who has ever run a business before knows that there’s a lot of work that goes into it. You sit in boring meetings, work with clients, juggle employees, and have a million other things on your mind. Your flowers are probably the last thing you want to think about – for a landscape company, they’re top priority. A Professional Eye – If it’s been a while since you’ve changed your landscape work, having a maintenance company come in can really benefit you. They’ll be able to help you plan for new landscaping and make your outdoor space as appealing to the eye as possible. This way, you can draw more customers in and take pride in how your business looks from the outside in. At Atlantic Maintenance, we know that your business is as important to you as ours is to us. For that reason, we want to help you make it beautiful! We are a self-performing landscaping company, meaning we don’t hire subcontractors, and senior management is involved with every project. Our highly trained team of professionals receives constant, ongoing education on the latest industry trends, updates and safety measures. This ensures we can deliver outstanding customer service and results to our clients, regardless of the size of your job. If you have any questions about commercial landscape maintenance, or to get your free quote today, give us a call at 410-768-4720 or contact us via our website today. This entry was posted on Friday, May 9th, 2014	at 4:38 pm	and is filed under Lawn Maintenance Service	. You can follow any responses to this entry through the RSS 2.0	feed. Both comments and pings are currently closed.